C-40, Market Building, Sahid Nagar, Bhubaneswar - 751007, Odisha(Orissa), India. Hiraknud Dam Orissa, constructed across the Mahanadi River, around 15 km from Sambalpur of Orissa, is one of the world’s longest earthen dams. The dam, established in 1957, holds behind it 55 km long lake, Hiraknud Reservoir of Orissa. There are several Hiraknud Dam Orissa Attractions to pull a number of tourists towards it. The travel enthusiasts, who want to see the grace of the world’s longest man-made dam, visit the destination. The name the dam Hiraknud is often mispronounced in the North India as Hirakund. 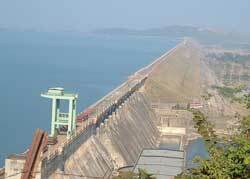 Hirakud Dam, the longest man-made dam in the world, is around 16 mile (26 km) in length. Another remarkable feature of the dam is that Hirakud project is one of the first major multipurpose river valley project undertaken after the independence of India. The dam with the channel offering an ideal atmosphere for the wildlife makes it again a place of the tourist interest. The wealthy Debrigarh Wildlife Sanctuary located here is visited by a number of tourists each year. You can spot here numerous species of migratory birds coming to the reservoir during the winter season. About 20-25 genus of birds can be observed in the reservoir. Common Pochard, Red-crested Pochard and Great Crested Grebe are the most common varieties of birds among the large range the reservoir holds.